A discussion of the best way to dispose of the body of a transient man believed dead is not what you'd expect to find in a heartwarming Christmas comedy. 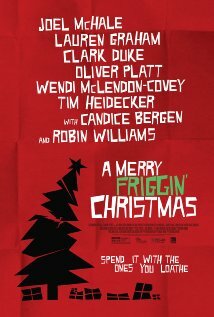 A Merry Friggin' Christmas proves the validity of those low expectations; this is one awful film. Sadly, this was one of Robin Williams' final films. Williams plays Virgil Mitchler, the alcoholic patriarch of dysfunctional family meeting together at Christmas for the first time in years. The family is brought together by a christening in a church, which is what brings me to this miserable little film. Nelson (Clark Duke), a son of Virgil, was abandoned by his wife. She returned a few months later and dropped off a baby that wasn't Nelson's. He decided to have his son, B.J., baptized at his church on Christmas Eve. As always, we are here to talk about the church in the film, rather than the film itself (which I can assure you, you want to avoid). On Christmas Eve, the choir is leading the congregation in singing "It Came upon a Midnight Clear." Virgil makes up his own lyrics to the melody, singing, 'They didn't give lyrics to this song, so I can't sing along." It might be reasonable, perhaps, to expect the Christmas Eve congregation to know the first verses of "Joy to the World" or maybe "Silent Night" but not "Midnight Clear." For the christening, Nelson is given a mike and allowed to tell the story of his abandonment and his child's Mexican paternity. I'm not sure all the visitors came expecting hear such a story, and there seem to be no limits on how long Nelson is free to speak. A church should always be careful with open mikes and testimonies, especially on Christmas Eve. 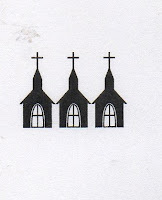 Now, it's always a tricky proposition to judge a church by the behavior of its parishioners, but one really would have to wonder about a church frequented by the Mitchlers, who spend their Christmas Eve in bouts of drunkenness, coarse talk, reckless driving and, as mentioned before, disposing of bodies. 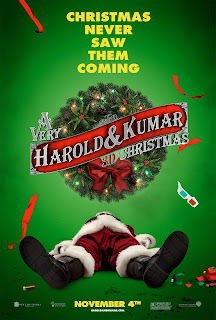 Christmas with the Kranks is a much more wholesome comedy than the other two films. Not funnier, mind you, but PG rather than PG-13 or R. There is no church to be seen in the film, but there is an interesting church mention. Based on the John Grisham novel "Skipping Christmas" (and not only is there no church, there's also no courtroom), the film explores the ramifications of a couples' decision to take a cruise rather than celebrate Christmas. The Kranks decide not to spend money on the trees, presents, decorations, etc. But the husband, Luther (Tim Allen), also wants to withhold their annual donation to their church and the children's hospital. The wife, Nora (Jamie Lee Curtis), insists on giving $600. What I found vaguely interesting is that Luther surprises Nora with the news they had spent $6000 the year before on Christmas. So their gift is roughly a Christmas tithe. Which is generous and all, but considering they spent $83 the year before on "ornament repairs", the gift pales a bit. 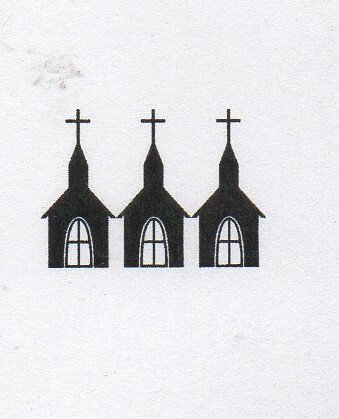 These films are all bad, but we're giving the churches in them a generous 3 Steeples. After all, it's Christmas. How Well do you Know Christmas Movie Churches?